If you can relate to any of these issues, you are not alone. Trust me – it happens to all of us. The question is – what can you do about it? I outline several techniques below that you can use to help you get into gear and bring success your way. 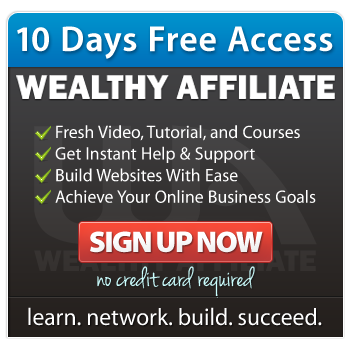 If you are trying to make money online then your most obvious goal is to have more money. What you need to focus on is what do you want to do with that money? What kind of life do you want to live? What kind of person do you want to be? If you had total freedom of choice, what would you do with your life? If you can answer these questions you will be able to create a vision for yourself that you can work towards. By revisiting your vision you can raise yourself above the ongoing everyday tasks and find new energy and motivation to do what you need to. Whenever you find yourself procrastinating or getting distracted, first return to your vision to remind yourself of where you will end up once you achieve success. If you can connect to your vision, motivation and energy will quickly follow. One of the things that interferes with making progress is not having a clear picture of what you are trying to achieve and how you are going to go about achieving it. This is why setting clear, specific, goals is so important. The process of goal setting will help you to clarify exactly what you should be doing right know and help you focus on exactly what you are trying to achieve. Once you have specific clear steps about what you are doing you will find getting them done is much easier. Another aspect of goal setting is research. Sometimes you have to learn more about what you are trying to achieve in order to know what tasks are involved. It can be very easy to become overwhelmed with a task and continuously put it off. Large tasks can appear like a mountain in the middle of the road that you feel you have to climb all at once. Because of this people often put off tackling the mountain until they feel they are ready which, of course, doesn’t always happen. To deal with this you have to break down the large task into smaller problems. Let’s say you want to publish an article and you never have before. This can seem overwhelming. But if you break it down into specific tasks, such as: pick an article topic, pick an article template, pick an article directory, create an account at that article directory, etc. Furthermore, each of these tasks can also be broken down if they seem overwhelming. You will find that this approach will make your activities much easier. Progress may be slow at first but as you master each little piece you will be better able to take on larger and larger tasks and your daily activities become much easier. One of the hardest things to accept is that achieving your goals can take more effort than you realized. I can’t tell you how often I run into issues where I say I’m going to do something, like write two blog posts a day, then realize halfway through the week I haven’t had the time to write even one. At this point I may just say I’ll never achieve what I want. The truth is, I just didn’t have realistic expectations in the first place. This situation isn’t a failure – it’s feedback. Feedback about what I can realistically achieve. Sure, I may not have an automatic six figure income in six months. But lets be honest, if our vision and goals inspire us then they are worth the extra time and effort because without it we will never achieve them. Sure, we all want to achieve our goals tomorrow, but failing that, would you prefer to achieve them later, or never? One of the best techniques I know for overcoming procrastination is to just start. Start the task you have been putting off – even if you have no intention of finishing it. Start even though you may be unclear of exactly what you are doing. Start even if you only have five minutes. Starting a task is often the most difficult step. Once started, though, it is very easy to keep going. This is why it is so important to just start doing it. If you find that you can’t even take this step, or you can’t stick with it more than a minute or two, then you should spend some time reviewing the above points. This entry was posted in Time management and tagged Goal setting, procrastination. Bookmark the permalink.